If you are one of those strange, well-moneyed souls who enjoys modifying supercars, you’re spoiled for choice when it comes to tuning outlets. Throw a fat wad of bills at Hamann, Underground Racing, Liberty Walk, Mansory, or Novitec Rosso, and your Ferrari or Lamborghini will emerge with acres of extra bodywork, a flashy wrap, a deafening exhaust, and heap of extra horsepower. Now, a new tuning firm is on the scene, offering a carbon fiber re-skin of the Ferrari F12. 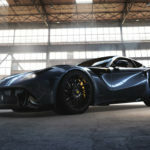 Called the Bengala F12 Caballeria, it’s the newest creation of the eponymous Spain-based tuning house Bengala. Details are scant, but according to a report from Autocar, the Caballeria is essentially a re-skin of the regular F12. Per Autocar, each body panel is redesigned in carbon fiber, inspired in part by Ferrari’s GT3-series cars, like the new 488 GT3. Again, Bengala is keeping technical details close to its chest, but Autocar does claim the Bengala packs the same 6.3-liter V-12 engine from the base car. If left alone, the regular F12 produces a monumental 731 hp and 509 lb-ft of torque, allowing the supercoupe to smack 60 mph in just under three seconds, rushing to a top speed of 211 mph. Bengala does not list the price for this creation, but we’d imagine it won’t come cheap. If you want one, get in touch with the Spaniards soon, as they only plan on offering ten of these cars per year.